There are two main types of heart murmurs: innocent heart murmurs and abnormal heart murmurs. An innocent heart murmur occurs when too much blood flows through the valves. Usually, this type does not require any medical intervention if the heart is healthy. Innocent heart murmurs can arise after a strenuous exercise, due to lack of red blood cells in anemia, and during pregnancy. Abnormal heart murmurs can reveal a defect either in the heart’s muscular structure, or other valve abnormalities. Hardening of the valves, which commonly occurs with aging, can also cause heart murmurs. Depending on the type of heart murmur you have, a follow-up appointment with your physician or a cardiologist may be required. The type of heart murmur you have determines its possible causes. For an innocent heart murmur, common causes are physical activity, anemia, and pregnancy. For an abnormal heart murmur, there could be abnormalities in the valve structures. Mitral valve prolapse: When the mitral valve does not close properly due to ballooning out, this is known as a mitral valve prolapse. Normally, this condition is of minimal concern, but it can cause the blood flow to go backwards through the valve. Mitral valve or aortic stenosis: Stenosis is narrowing of the valves, which can cause the heart to work harder. If this condition is left untreated, it can ultimately lead to heart failure. Aortic sclerosis and stenosis: In this case, the murmur is a result of scarring, thickening, or stiffening of the aortic valve even without narrowing. This is commonly seen in individuals with heart disease and can lead to chest pains, shortness of breath, and even fainting. Mitral or aortic regurgitation: In aortic regurgitation, the blood is going the wrong way, so in order to counteract this, your heart overworks, pushing more blood through the damaged valve. 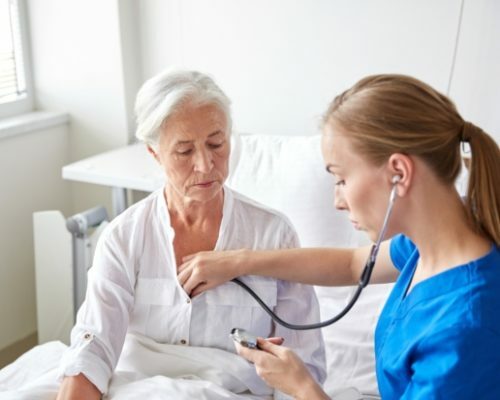 Risk factors for a heart murmur include congenital defects of the heart valves, heart valve diseases or infection, and other heart valve abnormalities including atherosclerotic heart disease, heart attack, aortic aneurysm, and connective tissue disorders such as systemic lupus erythematosus and Marfan syndrome. To properly diagnose a heart murmur, the doctor will review your medical history and conduct a physical examination. The rating will determine whether further examination or follow-ups are required. An innocent heart murmur doesn’t require treatment as it is not caused by a heart problem. Abnormal heart murmurs, on the other hand, do require treatment. There are many options such as treating the underlying cause like anemia or hypothyroidism. Medications and surgeries may be resorted to if congenital heart disease is the cause for the abnormal heart murmur. If the cause is a heart valve disease, then treatment will depend on the severity and type of the condition. There is currently no cure for heart valve disease, but healthy lifestyle choices like a proper diet, regular exercise, and smoking cessation can help improve the condition. Nevertheless, surgery will be required over time to repair the damaged heart valve. Heart murmurs can be prevented by exercising regularly, managing blood pressure, not smoking, eating a healthy diet, controlling cholesterol and diabetes, managing a proper weight, and lowering your risk of overall infections.